The Ryobi 1.5 Peak HP Corded Router has a powerful 8.5 Amp ball-bearing motor that provides long-lasting high performance. The durable base is constructed of die-cast aluminum to provide accuracy and stability, while the ergonomic handles offer increased user comfort. This kit includes a 3-piece router bit set to get started with projects right away. Milwaukee BodyGrip<sup></sup> Routers featuring the industry's first tactile handgrip designed into the base of the router, a fast, accurate linear depth adjustment system, a patented above-the-table depth adjustment mechanism, and a carrying case with integral Router Station. Featuring a 1 3/4 max hp (11 AMP, 24,000 RPM) Milwaukee motor, these powerful and precise new routers give you the upper hand in all but the heaviest of cuts. The BodyGrip<sup></sup> design is a comfortable over-molded rubber grip wrapped around the base with an adjustable hand strap that allows for left and right-handed operation, and two over-molded palm-grip side handles for superior comfort, maneuverability and control. Milwaukee's heavy-duty, 3-1/2 max hp fixed-base production router, model 5625-20, features a powerful 15 AMP Milwaukee-built motor with electronic variable speed (10,000-22,000 RPM), premium feedback circuitry and soft-start. To ensure a consistent, quality finish, the 36-position speed dial allows the user to precisely match the tool RPM to the bit diameter while the premium electronic feedback circuitry maintains speed and power under load. For controlled start-ups and reduced motor wear, the 5625-20 router also features a reliable electronic soft-start. PORTER-CABLE 2 1/4 Peak HP, Multi-Base Router Kit w/ GripVac Attachment. Soft-starting, 12-amp motor featuring full-time electronic feedback (10,000 - 23,000 RPM). GripVac handle for single hand gripping, palm gripping, and through-the-top dust collection. Motor transitions quickly between GripVac base (included), plunge base (included), and traditional spiral down bases (690 series). Release the motor, adjust bit height, and clamp the motor from above the router table with 3/16" hex socket (not included) or model #75301 kit (not included). Dual-position on/off switch with automatic bit-changing lock-"off". Macro-height lever for coarse adjustments and tool-less motor release. Fine depth settings to 1/128" with micro-adjustment knob. Plunge base features thumb rotating stop turret, brass bushings, finger adjustable micro-depth stop, and through-the-base dust collection. Includes router motor, base, 1/4" collet, 1/2" collet, collet wrench #42596, GripVac handle, two carrying case and operating manual. 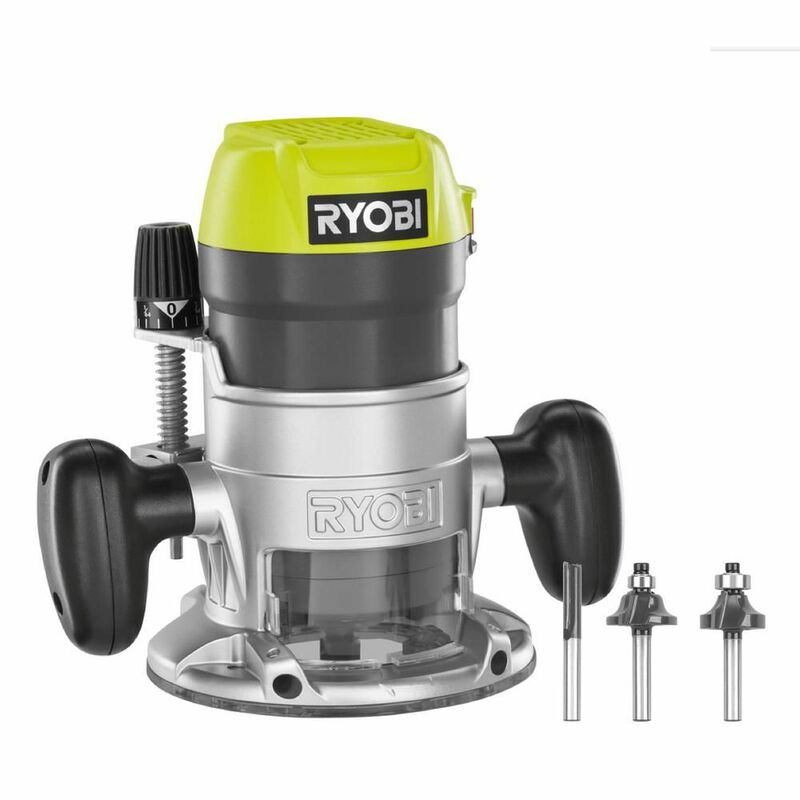 8.5 Amp 1-1/2 Peak HP Router The Ryobi 1.5 Peak HP Corded Router has a powerful 8.5 Amp ball-bearing motor that provides long-lasting high performance. The durable base is constructed of die-cast aluminum to provide accuracy and stability, while the ergonomic handles offer increased user comfort. This kit includes a 3-piece router bit set to get started with projects right away. 8.5 Amp 1-1/2 Peak HP Router is rated 4.5 out of 5 by 350. Rated 5 out of 5 by JV from Works well in router table depth adjustments are good. Works well in router table depth adjustments are good. Rated 5 out of 5 by sw881113 from Bought this for some little projects around the house and... Bought this for some little projects around the house and it works great. Plenty of power and easy to use. Rated 5 out of 5 by Liz from I was a little intimidated trying to use this after... I was a little intimidated trying to use this after only using my dremel but it was very easy to use a just what I needed for cutting dados deeper than the dremel was capable of. Great tool!